Brighter, tighter version of my full-size Classic '71 Wide Range / Thinline Humbucker repros due to the slightly narrower coils and lower output. This is my smaller humbucker sized Baby '71 Wide Range Humbucker desigend to fit a standard Jazzmaster without any modifications to your guitar whatsoever. Classic 'doubled up' single coil sounds, fat & full - Great clarity and string definition with a bright warmth. Individual threaded pole magnets allow you to dial in each individual string to shape your sound and match the radius of your neck. A warmer, fatter mid-range than standard single coils and with a higher output they've more clarity, bite and spank than a standard humbucker. They're great for breaking up an amp or played just on the edge of break-up for a great fat bridge sound akin to a "doubled-up" Tele and a neck with a bright sweetness still with the warmth of an overwound pickup. Thinner custom manufactured baseplate and internal ferrous reflector plate & standard size Humbucker bobbins with medium speed scatterwound coils. 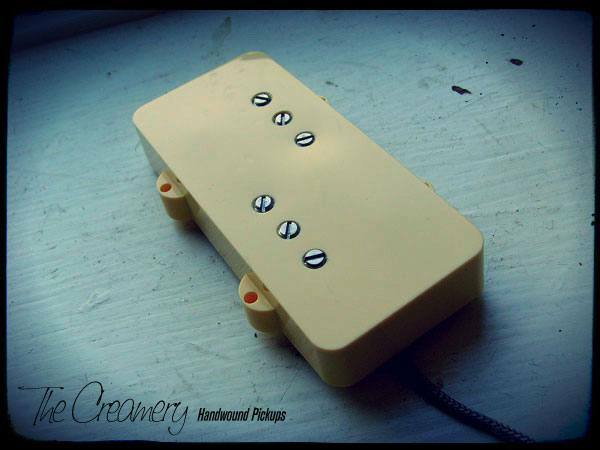 PLEASE NOTE: These pickups are a direct drop-in replacement for standard Jazzmaster Pickups.